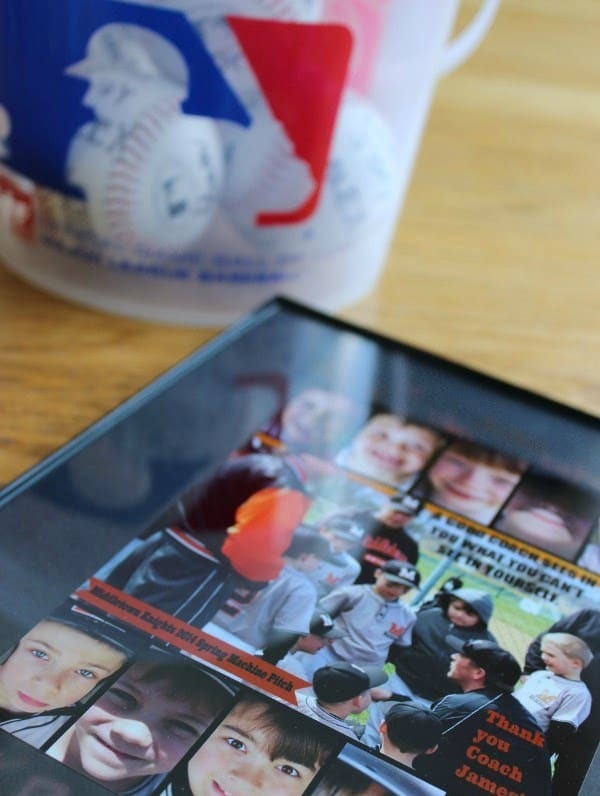 Want a DIY memorable coaches gift to show your appreciation for your kids’ coaches who, in most cases, volunteer their time with your kids? Sure you do! And the best part is, this gift is super easy to make and hardly costs a thing. 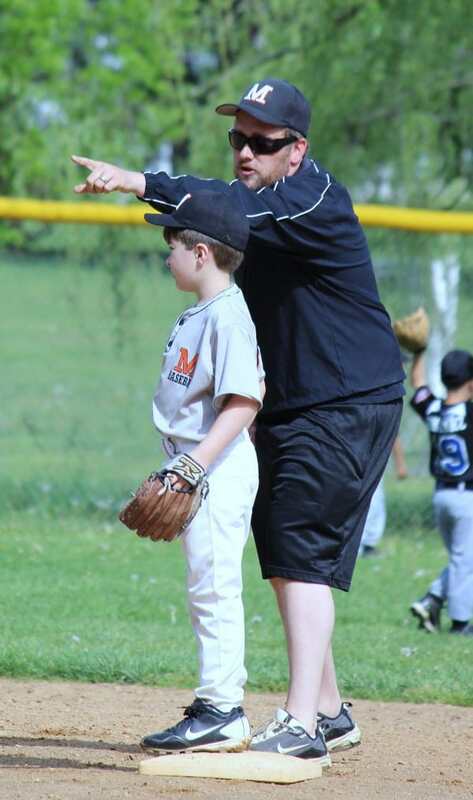 If it wasn’t for the amazing coaches my son has had through the years, the child wouldn’t know anything about baseball. But now he does. And I value these coaches tremendously. I put together the below image using PicMonkey. If you’ve never used PicMonkey before, check out our PicMonkey tutorial post. And here’s another tutorial on PicMonkey. I took pictures throughout the season and found the best one out of the bunch to use as the main photo. 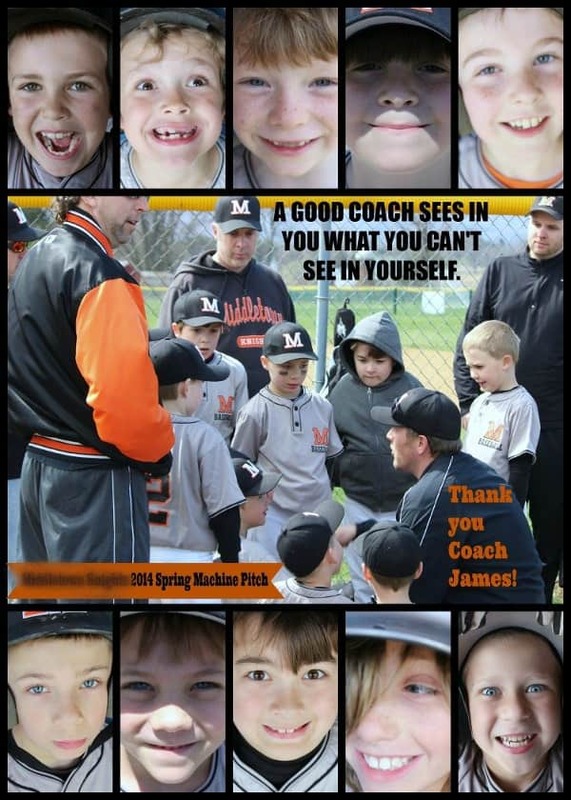 Then I took pictures of each kid on the team and created a collage. Then I added the text. Simple as that! Instead of printing the collage from my printer, I wanted a better quality so I went to Snapfish to order it. We gave the collage to the head coach because he was the one who volunteered the most time, handled the schedules, make-up games, etc. The other parent volunteers put in a huge amount of volunteer time as well. 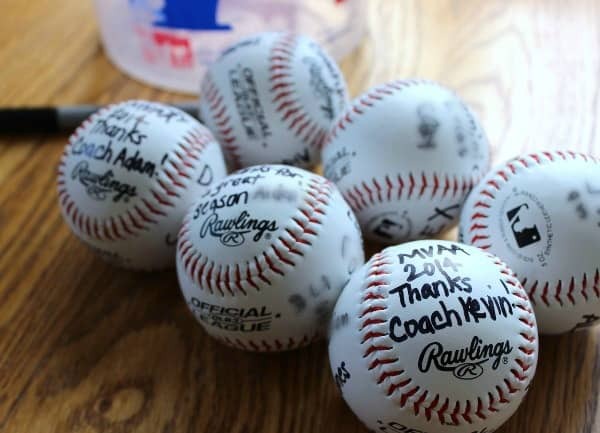 So we decided to get a bucket of balls and have each kid sign the balls to present to the other parent volunteers. I attached the PicMonkey collage to black scrapbook paper and had each kid write their first name by their picture. Then I framed it. 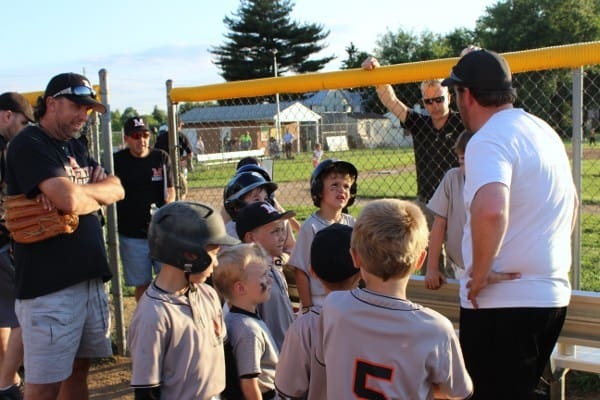 The above picture was the end of our kids’ season. We had lost and didn’t make it to the championships. But it doesn’t matter. 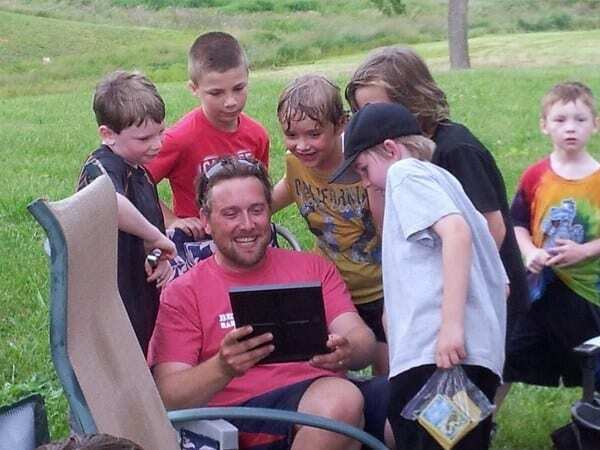 These kids learned so much and played their hearts out. And these coaches made it all possible. No words can really express my gratitude to each and every one of them. An experience that can never be taken away from my son. This is GREAT!!! There’s nothing more American than kids playing baseball. Nice job Pam. Thank you Linda! 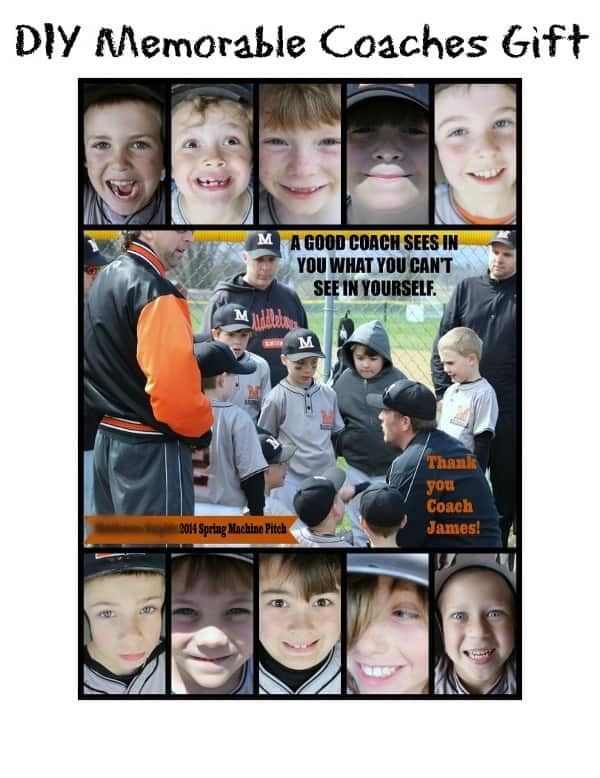 It was so easy to put together and my son’s coach was so touched by it. How did you get it to print on an this size??? I have created a collage but when I send it to Walmart to print it will not print the whole picture without cutting off some of the kids??? I believe I edited the collage through our local Walgreens website. They have a way of showing you what the final product will look like before you click to buy. That’s where you can crop it better to fit, so that none of the picture is cut off. OH really? I would call them and ask them to make sure the pictures aren’t cut off before you pay for the copy.